Spring is in full bloom here in Texas, and with our warm climate, that means we can already start to enjoy our backyards and patios, but for much of America, there’s still a window to whip your outdoor spaces into shape before summer is here! So today, I thought I’d do a round up of outdoor living spaces for inspiration. The key word for any outdoor space is “comfort.” Outdoor living spaces should always say “pull up a chair and make yourself at home.” They should be spaces for afternoon naps, or late night conversations over wine and candlelight... both of which I kept in mind when I designed outdoor living areas for Drew Scott, on HGTV’s Brother vs Brother. I wish I could take a nap on the softly swinging daybed we designed, but we designers rarely get to nap in the spaces we create! And the casual deck living area below was designed with sunset and evening cocktails in mind! You’ll note that the comfort theme is present in both spaces: lots of outdoor fabric pillows and throws, and plenty of candles to keep things enchanting in the warm evenings. Don’t forget to add shade to some of your outdoor living space so it can be enjoyed on warm summer mornings and afternoons. 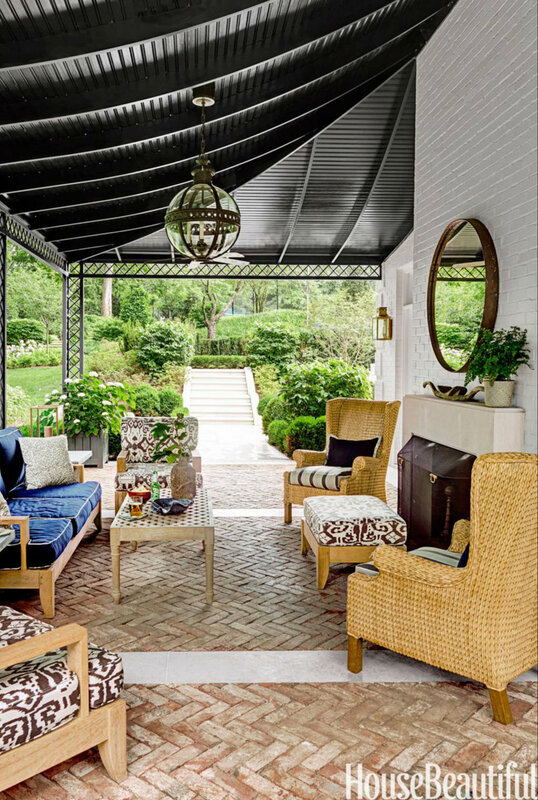 Your existing landscaping can provide shade as well, and I love the idea of hanging lanterns from a mature tree like on this California terrace. I honestly don’t know how much outdoor entertaining they did in 1772 when this house was built, but I’m sure the new owners do quite a bit with the modern update of a bluestone paver terrace. Old World meets new. A fireplace, like in this gorgeous loggia, is the ultimate in outdoor comfort, and it extends the life of this chic outdoor living room from early spring to late fall (note the ceiling fans for dead-of-summer heat as well). For more outdoor living inspiration, please visit my “Outdoor Spaces” Pinterest page!